Claims that Saddam Hussein had laboratories for developing weapons of mass destruction have been dismissed by a former chief UN weapons inspector. 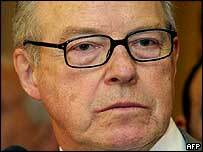 Hans Blix was speaking after Tony Blair said the Iraq Survey Group had already uncovered "massive" evidence of a system of secret laboratories in Iraq. But Dr Blix said it was "innuendo" to suggest laboratories were used for WMD. The row comes as the UK foreign secretary holds talks with Iraqi leaders on the Saddam Hussein's fate. Jack Straw is meeting leading members of the Iraqi Governing Council in London in the wake of the ex-Iraqi leader's capture. In an interview with the British Forces Broadcasting Service, Mr Blair had said: "The Iraq Survey Group has already found massive evidence of a huge system of clandestine laboratories, workings by scientists, plans to develop long range ballistic missiles. "Now, frankly, these things weren't being developed unless they were developed for a purpose." But Dr Blix said that the Iraq Survey Group (ISG), led by David Kay, had failed to produce any concrete evidence that the laboratories they had found were working on weapons of mass destruction. "I'm talking about the reactions to the David Kay report where he says that 'we have found laboratories' - well that's innuendo that laboratories were for WMD," Dr Blix told BBC News 24's HardTalk. Speaking in Sweden at the launch of a new independent commission on WMD, Dr Blix said it was "increasingly clear" that Saddam had not had any when he was ousted by US and British forces. "My guess is that there are no weapons of mass destruction left," he said. Dr Blix, who has come out of retirement to chair the commission at the request of his native Sweden, has already said Iraq probably destroyed its weapons in the early 1990s. When his inspection teams found a crate of warheads in January, he said they asked themselves "whether this was the tip of an ice berg, or was it just an ice floe floating around" as a remnant. Is this new information, or is it yet another loose and misleading use of language by the prime minister on weapons of mass destruction? "I think it's getting safer and safer to say that it was just an ice floe," Dr Blix said. Downing Street said the prime minister's remarks referred to Dr Kay's interim report published earlier this year and not to any new findings. But Tory shadow foreign secretary Michael Ancram accused Mr Blair of exaggerating the conclusion reached by the ISG in October, which had never used the word "massive". "Once again it is the prime minister using language and playing fast and loose with language on a matter which is very important and he must be careful with what he says," he told BBC Radio 4's Today programme. Attention in Iraq is still focused on the weekend's capture of Saddam Hussein. US President George Bush has said the ex-Iraqi leader should pay the "ultimate penalty" for his crime - a sign that he wants the death penalty to be used. The UK and US say he should be tried by the Iraqis, but British ministers say they oppose the use of the death penalty. The possible trial of Saddam Hussein is likely to feature when Mr Straw meets Abdul Aziz al-Hakim, the leader of the Iraqi Government Council, at the Foreign Office. The council held similar talks with political leaders in Paris on Tuesday. "The hard task of rebuilding Iraq remains"